Thanks to all attendees of our contest. We've selected the best 3D images and sent them to our partner, ColorCode 3D. They will choose the winners - and we will bring you more informations in next weeks. So - how exactly was it possible to attend the contest? 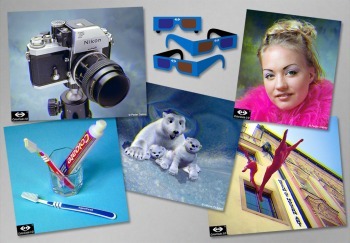 You had to choose the 3 best of your 3D photos and send them via e-mail to the address . Attention! It's necessary to send not only anaglyphs (for cyan/red glasses), but photos for left and right eyes (stereo-pair you have used to create the anaglyph) separately as well. Why? We've prepared this contest with ColorCode 3-D Center ApS - and ColorCode 3-D system of this company works with a different color coding than the anaglyph (you can read more in this article ). We will use anaglyph images to select nice images, stereo-pair will be used to create images in ColorCode 3-D system. Don't miss this opportunity to get more ColorCode 3D Viewers for you and your friends, to create great 3D images in really interesting 3D system ColorCode 3-D and to show your photos on ColorCode 3-D website. Every member of 3D Journal club can send his (her) photos! The deadline for accepting of photos is 15. september 2004 - 24:00 central european time. We are looking forward for your photos! Have a good luck!